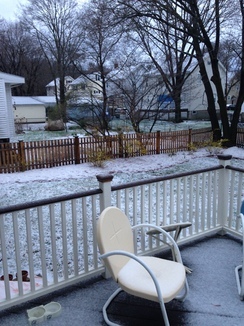 It snowed last night. 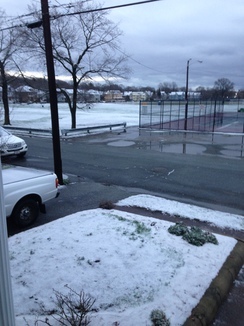 Our sailing friend, Marc said it would snow one more time, he calls it "Indian Winter." Marc made the prediction on a beautiful day last weekend during the Boston Sailing Center's Fair Winds of Spring party. Darn, Marc... couldn't you have been wrong? Just once? By the way, Marc is an economist so it is small wonder that he was right! On this day, in 2007, Elizabeth and I (Norm) finally got under way from Stratford CT to our new boat-home in Boston, MA. That year featured a tremendous storm that covered the US East Coast with flooding rain and destructive winds. It was referred to as the Tax Day Storm 2007. Today is similar weather although the boat circumstances are very different. This year, Averisera is on the hard, awaiting launching. We are at rest in our home in Medford waiting to close on the sale of this house before moving to a new home in Harwich, MA. 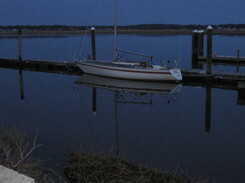 A picture of the boat alongside the pontoon at Housatonic Boat Club in Stratford CT. It was flat calm, the calm before the storm. So began a wonderful adventure. Today, I went over to see her. 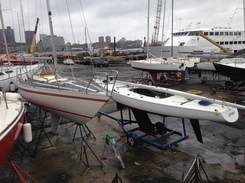 Averisera is hauled out at the Boston Sailing Center Boat Yard in East Boston, MA. Alongside is a Soling class keel boat. The Soling is the base design for the Aphrodite 101 of which ours is hull number 264. The story is that Paul Elvstrom wanted a Soling-like boat for ocean racing around Denmark and commissioned the Aphrodite design. We are launching on May 1 and planning to sail to our new mooring May 8. In other news: Our friends, Bill and Maura from Constitution YC and Boston Sailing Center have a summer house in nearby Chatham, MA. We hope to see them with their boat down in Nantucket Sound. They have a Cal 33-2, Tupelo Honey. 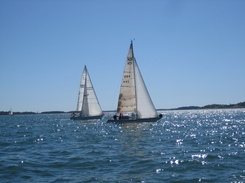 This is a picture of both boats taken by Tim Shea in 2011, I believe. Thanks, Tim. Our boats are the same length and have similar PHRF handicaps. They have hot and cold running water and standing headroom. We don't. Last bit of news: We have more time than ever before to sail. Nantucket Sound, here we come.